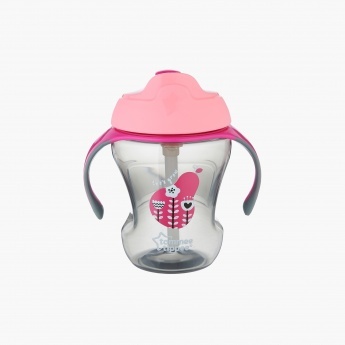 Tommee Tippee Easy Drink Straw Cup with Handle | Multicolour | Large 10 oz./300 ml capacity bottle to keep busy toddlers happy and hydrated. Keep your toddler busy and happy as you give tasty feeds in this adorable straw cup with handles. It sports a comfortable spout which clicks down to prevent spills, and a valve to keep mess to a minimum. Feature 2 : Sports spout clicks down to stay clean and stop spills. 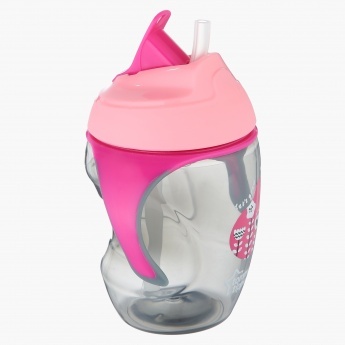 Feature 1 : Large 10 oz./300 ml capacity bottle to keep busy toddlers happy and hydrated. Feature 3 : Removable, two-piece non-spill valve keeps mess to a minimum.